It's a sad day for me. This is my final post as a Doodle Pantry Design Team Member. Things are just a bit crazy right now for me and Laurie gave all of us the option of staying on for another term or "retiring." Since I wasn't sure I'd be able to fulfill my responsibilities as I'd like, I decided to step down. But, since you know how much I love Doodle Pantry digital images, this won't be my last project using Doodle Pantry papers or images. I used flowers from the Joyful Day set. 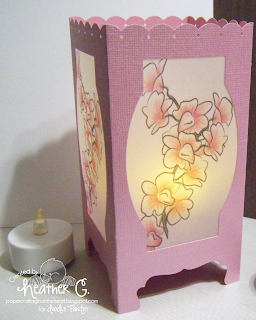 Printed on vellum, it allows the image and votive light to shine through the lantern. The shimmery pink cardstock is 12" x 6" ~ I went with 6" tall so it would fit through my die cutting machine. Each side is scored at 2-7/8" so I had a "tab" at the end. Score tape all around the openings makes for easy placement of the vellum pieces. I didn't want the votive to be seen through the "legs" so I created a "ledge" and everything lined up on my first try. That does not happen very often ... believe me ! Using Doodle Pantry pre-colored images allowed me to finish this project in under 2 hours from start to finish. Wow, this is gorgeous! I'm sorry to hear you're leaving Doodle Pantry... but I'm sure not as sorry as they are to lose your creative uses of their images! I so love this card!!!! It is gorgeous and seems like it'd be easy to make! Thank you!